Polymeric cryogels, the gels formed in moderately frozen gelling systems, have been empirically known for many decades, but systematic scientific research on various cryogels and the peculiarities of cryotropic gel formation only commenced at the beginning of the 1980s. This historical review briefly describes the principal stages of the studies on these very interesting gel materials. It also discusses some mechanisms of their formation, as well as summarizes published data on the main representatives of chemically crosslinked (covalent), ionically linked, and noncovalent (physical) cryogels. 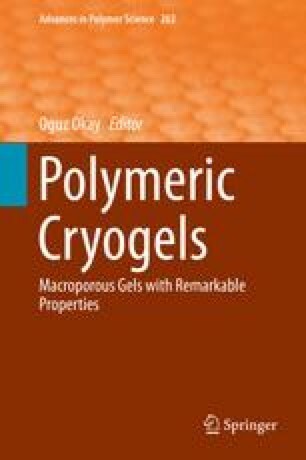 The author expresses his great appreciation to Oguz Okay for very productive discussions on polymeric cryogels and for help in preparation of the present review. The work was supported in parts by a grant from the Russian Foundation for Basic Research (RFBR Project # 12-03-00216-a), as well as by a joint Russian–Turkish grant from RFBR and the Scientific and Technical Research Council of Turkey (Project # 12-03-91371-CT-a).